Breakups, no matter how done, can be brutal. Regardless of whether you were bracing yourself for it or have seen it coming all along, living through it can still be a nightmare. And in some cases, it affects people so much that they no longer possess the motivation to work or the physical capacity to muster the energy to get out of bed. However, know that while it might not seem like it now, you are not going to feel that way forever. You will heal, and you will soon move on, but in order to appreciate the enormity of your accomplishment after that, you need to grieve as well. After all, moving on is a process, and before you get anywhere near forgetting the person who broke your heart, you need the pain to hurt, and you need to feel it until it can no longer harm you. After you have dusted yourself off and cried yourself to sleep for countless nights, get out of that bed and face the world with your head held high once more. At some point, this is going to be easier than you had imagined it to be. Unfortunately, getting out of bed and being a functional human is the easy part. Getting back on track and being your chirpy self once more can present a bit more of a challenge. No rush, however and just take as much time as you need. 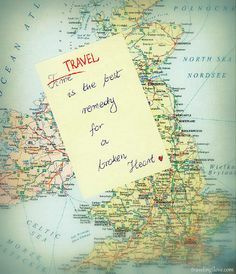 One of the excellent and most pleasant distractions is to plan a travel itinerary—especially when you are trying to mend your broken heart. The prospect of researching places and looking for activities to do are not only educational but healthy as well. Besides, it gives you something else to think about other than wallowing in the hurt. Once you reach your destination, you might get lost and be forced to find your way. When you succeed, you will be able to show yourself that if you can handle that, you would be able to manage your heartbreak. When you are trying to heal a broken heart, little things such as getting around alone, driving, seeing new places, tasting new foods and the like can already feel like significant achievements. Whenever you feel self-doubt plaguing you, remember that you have this—even by yourself. Know that despite what you are going through, you can still come out strong. You may be emotionally crippled, but you are still physically able. So, go on head and venture forth. There is a truth to the saying that travel serves as the healing balm to emotional wounds. Being in a foreign place, immersing yourself in a new culture and doing your very best to get yourself out of a rut are all necessary things that would culminate in growth. Sure, these are all things you can do at home but they will feel a whole lot better and will have more meaning attached to it when it is done in a foreign place. Furthermore, being in a new and unfamiliar place encourage independence as well as freedom. If you can do something while you are overseas, there is no doubt that it would boost your confidence in doing just about any task at home. Unless you intend to lock up in your hotel room for the duration of the trip, you will inevitably meet someone along the way. More often than not, these are people with similar interests as you do and sometimes, they, like you, are alone as well. With this in mind, you will come to realize that even when you are alone, you really are not all that alone. You will be surprised; you might just turn these strangers into friends if you are open to the idea. However, be sure to be safe about it and keep your eyes open. With all these considered, go out, travel and heal yourself. You only have one life ahead of you and you should not be wasting it by moping for the rest of it.